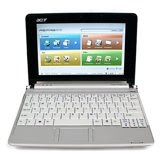 Acer is reportedly discussing the possibility of bundling 3G wireless modems with the company’s Aspire One mini-laptop in Europe. Network World says Acer is talking with T-Mobile, Vodafone, and Orange in Europe and Chunghwa Telecom and Taiwan mobile in Taiwan. The move isn’t particularly surprising. The Aspire One has a slot for a 3G card, even if that slot has gone unused so far. And other subnotebook makers including Asus have already announced plans to partner with wireless carriers. There’s no word on how much a 3G Acer Aspire One would cost. It’s possible that a wireless provider could choose to subsidize the price for customers who are willing to sign up for 1 or 2 year contracts.